Simultaneously a multi-disciplinary studio and a material, FELT is a design agency founded by Kathryn Walter, a Toronto, Ontario artist. Eschewing all other materials, Walter has become a master of one. She blends this versatile textile into a variety of interior spaces for her clients. This specialization allows her studio to deliver a high degree of quality and customization in everything that they create. In Walter’s “Striation Variation” series, felt is stacked in strips of varying sizes and colours, creating a dynamic design application that can cover both flat and curved walls and ceilings. Walter often incorporates recycled fibres and material remnants into the design. 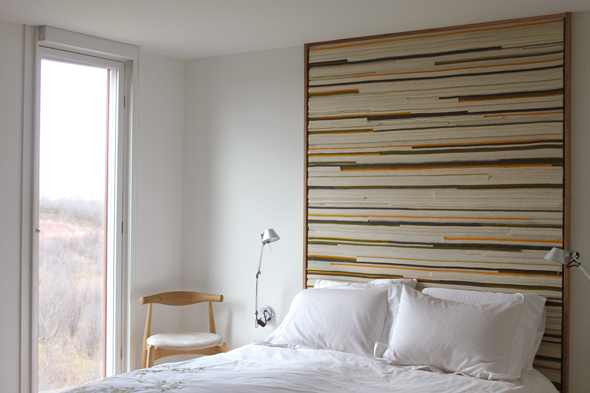 In this residential commission (below), a striated headboard of felt remnants and offcuts was created to inject coziness and colour into a bedroom. I love how the tones of the wool reflect the exterior landscape seen through the client's window. Through creative use of felt, an otherwise minimal and calm bedroom has been transformed into the image of a modern art gallery. The "Striation" panels can also mimic the look of natural stone – as in this outstanding fireplace design by FELT. This design looks edgy and modern, yet retains the soft tactile materiality of wool, making for an engaging and surprising feature wall. 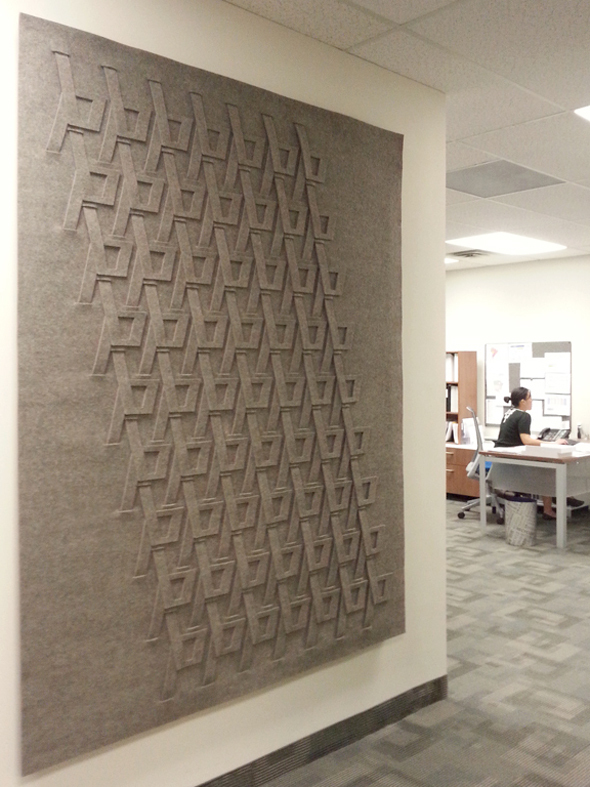 Felt is also a wonderful material for light and sound-absorption and is an attractive option for reducing noise pollution in the home or commercial settings. 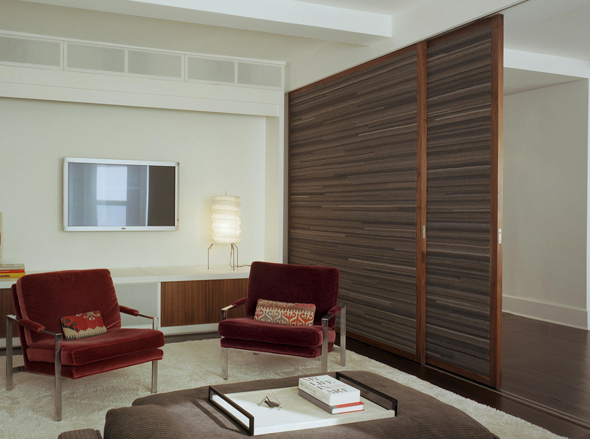 In this project, Walter installed sliding panels of “Striation Variation” felt in neutral colours to separate two areas of a large living and screening room space. Besides being cut and layered to create a surface treatment, felt can be woven, braided, stacked, rolled, sewn, and hung. A creative and complex wall hanging that FELT created for an office space would also look amazing in a residential living room or hallway. The woven strips call to mind the traditional aspects of textile making across the globe, while the architectural patterns created are geometric and modern. 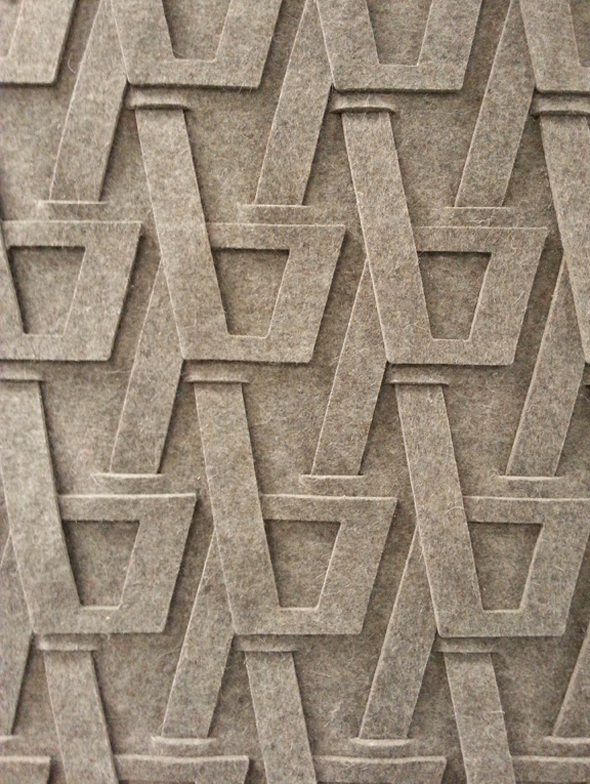 This up close view of the stunning feature wall shows FELT’s excellent craftsmanship in the creation of this pattern. 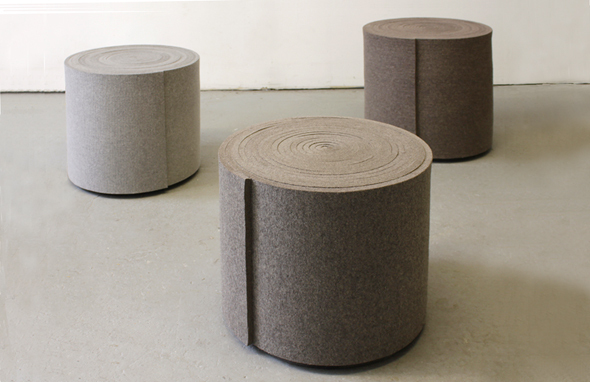 Studio FELT has also created a line of sculptural stools available for purchase in three different sizes (shown below). I think the design is reminiscent of spools of thread and ribbon used by a tailor, or the rings on a tree trunk. These stools are perfect for those who appreciate well-designed and comfortable furnishings. Felt is mainly produced from wool, (a renewable resource) and is natural, comfortable, traditional, and modern all at once. FELT studio is remarkably good at integrating felt into a variety of interiors, and exploring the full range of applications for this sustainable material. All FELT products are also made in Canada, making it an easy choice to add a little or a lot of this unique material to your home! Be sure to visit FELT’s website to view previous work for residential and commercial clients, and shop a selection of clever products. Photos courtesy of FELT studio. 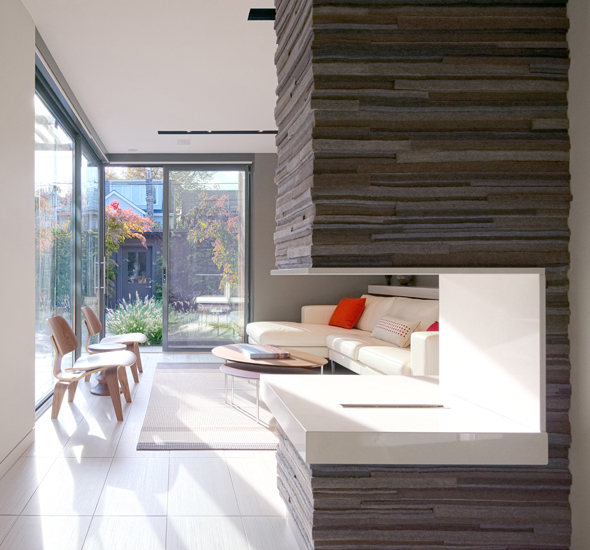 Check out some other amazing Toronto design stories!